In early 1783 a political and military crisis threatened to end the American Revolution in chaos. The British had surrendered at Yorktown and peace negotiations were underway. But the nation was broke. Congress was weak. The army, unpaid and inactive, brooded over the nation’s seeming ingratitude for their service. The tensions came to a head in the so-called Newburgh Conspiracy, a still mysterious episode at the end of the American Revolution when Continental Army officers, disgruntled by a lack of pay and pensions, may have collaborated with nationalist-minded politicians, such as Alexander Hamilton, to pressure Congress and the states to approve new taxes and strengthen the central government. 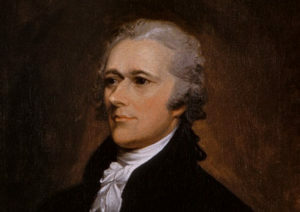 Ron Chernow, Hamilton biographer and Lin-Manuel Miranda’s inspiration for the musical, called the New York delegate’s role in the episode Hamilton “at his most devious.” Most scholars would agree. Head’s research takes a fresh look at Hamilton’s role in the Newburgh Conspiracy. Newly discovered evidence suggests a true conspiracy was not really afoot but that Hamilton was playing the hardball politics far more typical of the founding fathers’ style than people realize. The American Revolution may have been the Glorious Cause, but as Hamilton and the Newburgh Conspiracy will show, its ending was anxious and uncertain.